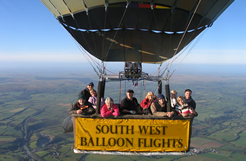 South West Balloon Flights offer hot air balloon rides convenient for passengers from Wiltshire to Cornwall at the most competitive prices available. We are the UK’s first totally online hot air balloon ride operator enabling us to pass on a significant saving to you. Purchase a balloon ride voucher to experience a flight from one of our stunning locations in Wiltshire, Dorset, Somerset, Devon & Cornwall and enjoy the breath-taking views of some of the most beautiful landscapes in the UK. We offer an efficient and simple voucher buying process which can either be used by the purchaser or given to a loved one as a gift, who are then able to book on to flights from any of our locations during the flying season (April – October) and enjoy the magical experience of lighter than air hot air balloon flight. The total experience lasts approximately 3.5 – 4 hours and for a small charge can include luxuries such as champagne and in flight photos. All to make the once in a lifetime experience that bit more special! We are a family run business and have been operating balloon flights for over 25 years. South West Balloon Flights is an online service where you can purchase vouchers, book flights and add extras – all online! This enables us to pass on the savings to you by reducing administration, paperwork and telephone traffic. As a result, you can purchase a hot air balloon flight from as little as £99.99, which is significantly less than the standard price of a hot air balloon ride elsewhere! If however you prefer to speak to someone and talk on the telephone, please purchase via our parent company, Aerosaurus Balloons, who will be pleased to provide full telephone support. If you would like to fly in Bristol, Bath or South Wales, please contact our sister company Bailey Balloons. We hope you enjoy your buying experience and we look forward to flying you & your loved ones very soon.